I started to write this blog last week on Hosta. I guess I wasn't overly inspired because it just sat there a while. Andrew brought home this bench last week. He has been wanting a bench for the garden for a year now. There was no where to sit and enjoy the garden. But I think the reason we were slow in getting one is that we just haven't seen the one we wanted. They are either to plastic-key (not sure if that is even a word but you know what I mean), too big or too park bench like.﻿ We wanted something to blend in. Well blend in it does, since it is black wrought iron (looks-like) it really does blend in. If you are not looking for it you could miss it. I thought I would take a picture of what I could see if I sat on the bench. 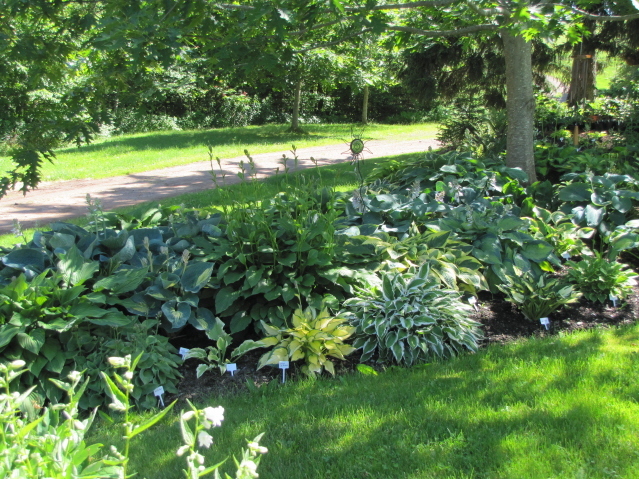 Directly in front is the new hosta bed that replace the grass bed last spring (2010). We can also look up the driveway and if we sit just right see cars going by the driveway. We can not see the cars from the house (not that there are many where we live) anymore because the trees have filled in so much. We even had to have our satellite dish relocated on the house last week﻿. ﻿Back to the hosta bed. 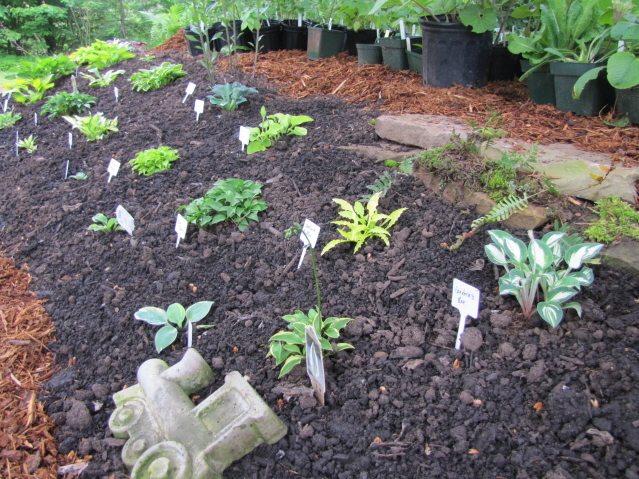 I was nicely spaced last year, there was plenty of room between the hosta to show them off nicely. But that just shows you how fast these guys can grow especially with all the rain we had this spring. There will be some little ones like Golden Tiara and Orange Marmalade that will be moved to a different spot. 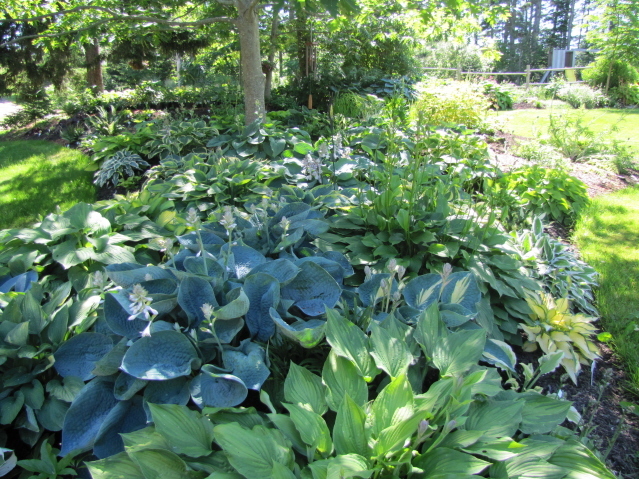 Even though they are good sized hosta they are being dwarfed by the larger ones. I will be making a map and taking pictures and planning which ones go where next spring. When the spruce tree came down this spring, I moved all the miniature hosta into pots for safe keeping until the bog garden was done and I figured out where to put them. 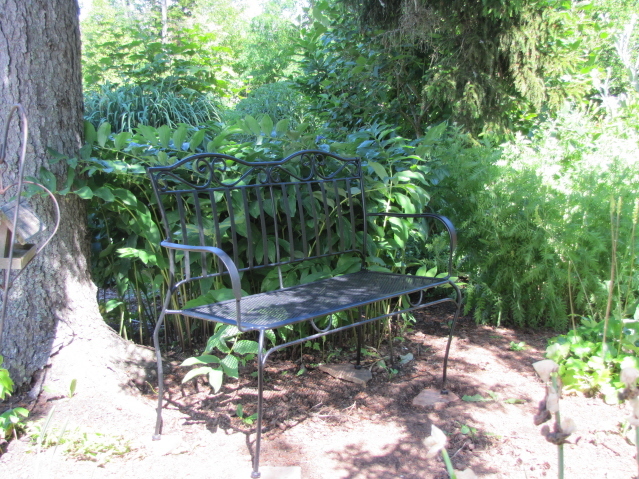 This bed, along where the shade plants are for sale, contained Pulmonaria (lungwort) and ferns. We moved them to the back of the bog garden. The miniatures went in there a few weeks ago. I have two I have no names for. I need to go back in my records in the past few years to try to figure out who they are. Any hosta collector out there who wants to identify them for me is welcome. Getting back to that bench. Some times things happen for a reason. Andrew was in A J Walkers (Truro local Hardware Store) two weeks ago and saw this bench in the window. It had a sold sign on it so he asked if there were anymore. There were not and at the price of $39, I can see why not. The lady who put it on hold never came to pick it up so Andrew got it on Monday. It was meant to be.